I realize it’s been too long since my last post. You know how it goes—life gets super busy and the hobbies are put on the back burner. Normally, I wouldn’t feel too bad about it, but I’ve got a book sitting on my kitchen table that I promised to review. I’ve had it since, like, early June, and I can’t have it hanging on my conscience another day. Now that I’m ready to say something about this book, I realize I don’t really know what goes into a book review. Is it as easy as saying whether I like the book (or not) and why (or why not)? I’m sure there’s more to it, but I’m just going to put my opinion out there and let you decide what to make of it. Right. I should probably mention the name of the book...Cooking from the Heart: The Hmong Kitchen in America by Sami Scripter and Sheng Yang. And what did I think of it? I like it! The book isn't filled with artistically arranged food shots (there are few, but most recipes aren't accompanied by a photo), but instead we get the author's personal story, comments about the food, and stories, poems and pictures that show us a little of Hmong-American life. I like that the recipes, while allowing Western alternatives for hard to find ingredients, don't lose their boldness. But the true reason I like this book is I feel a connection to the food; it feels so familiar to the Northerneastern-style Thai food I grew up eating. The nostalgia alone is enough for me to give it a fantabulous review. If you want more information about the book, the authors, Hmong food and recipes I encourage you to visit Cooking from the Heart. 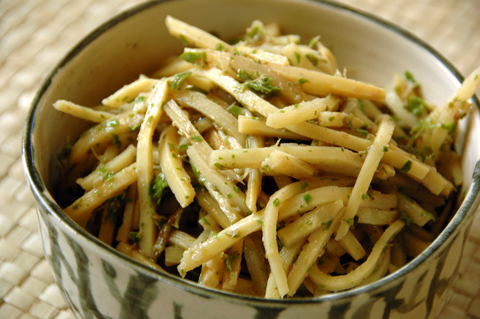 The recipe I've decided to share is for a spicy bamboo salad. I chose it because it reminded me of the bamboo salad Mom used to make. As the author says, the flavors in this dish are bright and bold, and I would have to agree. The cilantro gives it a really nice freshness. If you're worried about the shrimp paste, there's no need. It complements the bamboo; I think you'll be surprised how well the flavors go together. Grilling small Thai chilies is challenging, so I recommend toasting them on a dry skillet until they start to brown. In a large mortar, pound the garlic, chilies and cilantro until you get a uniform paste. Add the shrimp paste and incorporate well. Add the drained bamboo shoots and pound them lightly, turning with a spoon until they are uniformly coated with the spice paste. Be careful not to use too much force. You’re not trying to annihilate the bamboo shoots. Season with fish sauce, salt and lime juice (if using). Serve at room temperature or slightly chilled. Goes well with simple, grilled meats or fish and rice. I love that the salad is spicy, of course! I can't even begin to imagine how to grill a tiny Thai chili, though! Puna, I will check it out. I'll see if I can squeeze some creative cooking in this week. Manggy, I've had to turn down books because I just can't find the time to review them. Plus, I'm not good at actually writing a review. And grilling a Thai chili just looks silly. Better to toast them on a dry skillet. MM.....bamboo how I love thee. I prefer the cookbooks that have good stories in them versus a brain dump of recipes. with a good story it makes you feel like you are actually experiencing why the author loves the recipe. Jeff, thank you! The cultural relationship people have to food is very interesting to me. How/what people choose what to eat goes beyond taste. The stories in this book give a better insight about how the Hmong view food, not just what they eat. What an interesting recipe. I didn't know that anchovy paste could be substituted for fish paste. I usually learn something when I come here. I hope your summer has been enjoyable as well as busy. Hi Darlene! I've been on blogging hiatus for a while, and am getting back into the swing of things! I love this recipe! It sounds crunchy, spicy, and tangy all at once. I've never used shrimp paste. I've heard of it. Is it sold in a tube or jar or bag? I think I could handle pan toasting the chilies ... and I'll try not to annihilate the shoots! I think I'd like it at room temperature. Oh who am I kidding ... I'd eat it cold, too! Yum! Mary, IMO shrimp paste and anchovy paste have very different flavors (just as rice vinegar and white wine vinegar do, for example), but the book's author suggested the substitution. I wanted to stick to the recipe and suggestions as much as possible, even if it wasn't one I'd use. I had to add the lime juice, though. It made quite a difference. Paula, the shrimp paste I buy is Thai and it's sold in a tub. It's solid and dark, sort of like the color of milk chocolate, and it is quite pungent. I keep it in 2 ziploc bags in my fridge. I know Vietnamese shrimp paste is more pink in color and loose and fluid. Both are available at Asian markets that have SE Asian foods.